Charles Philbrick Eager was born in November 16, 1880, in San Francisco, California, according to his World War II draft card which also had his full name. His middle name was his mother’s maiden name. The 1880 U.S. Federal Census, enumerated June 7, said Eager’s father and oldest brother were printers. The family lived at 1527 Tyler Street in San Francisco. Eager was not yet been found in the 1900 census. The San Francisco Call, May 19, 1900, covered the Polytechnic students’ vaudeville show which included performances by Eager. The 1901 San Francisco city directory listed Eager and his father at 1527 Golden Gate Avenue. Eager’s father and two brothers were pressmen at the Chronicle. Eager was a student at the Mark Hopkins Institute of Art in 1901. 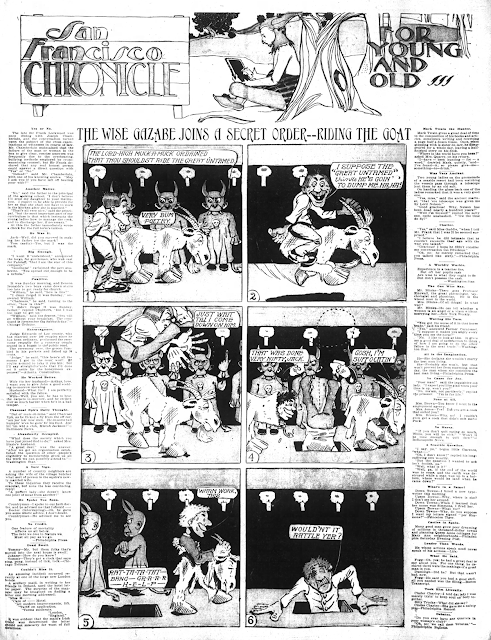 American Newspaper Comics (2012) said Eager produced two comic strips for the Chronicle. The Wise Gazabe ran from June 29 to September 21, 1902, and Chan Toy and Chop Suey from September 28 to December 14, 1902. The 1903 San Francisco directory said artist Eager resided at 1527 Golden Gate Avenue. Charles P. Eager, of the Chronicle, made one of the most interesting displays. His was all newspaper work of the best quality. It included the usual range of pen and ink work and all the different events. The color drawings for the comic “Wise Gazabe,” that appeared in the Chronicle, were particularly interesting. had lost his position as staff artist with the San Francisco Chronicle when the coast paper affiliated with the McClure Syndicate. 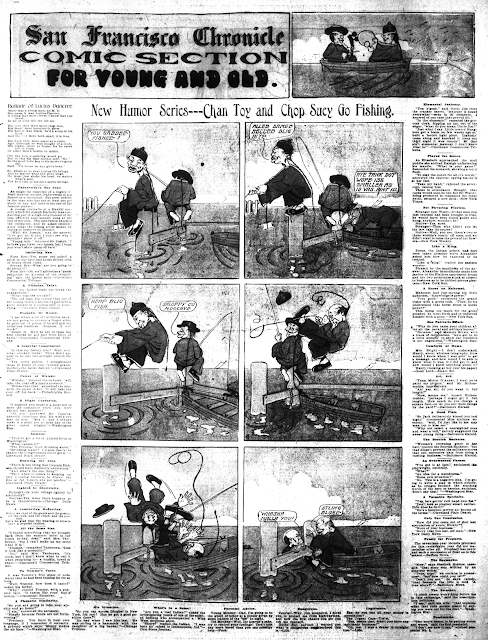 The Syndicate furnished the comic pages to the paper. Eager was recorded at St. Paul in the 1905 Minnesota state census. The Gazette-Journal said Eager moved to Reno in November 1906 and became the Gazette’s first cartoonist. Gradually, Eager did less cartooning because of his work for the Bureau of Land Management, traveling to Portland, San Francisco and Burlingame. In 1907 Eager’s father passed away January 27 and his brother William on July 19. The San Jose Evening News (California), June 29, 1908, noted Eager’s marriage, “Miss Gertrude Grey of this city and Charles P. Eager of Reno, Nevada, were married at the home of the bride’s mother on Wednesday evening.” They married on June 24. Eager and his wife were Reno residents as recorded in the 1910 census. The draftsman owned his home at 742 Plumas Street. Eager was a member of the National Society of the Sons of the American Revolution. He was secretary at the Reno branch. Eager’s mother passed away June 13, 1911. The Official Gazette of the United States Patent Office, January 28, 1913, published Eager’s patent of a parallel protractor. Eager was the exalted ruler of the Reno Elks. In 1917 Eager moved to San Francisco. Eager signed his World War I draft card on September 12, 1918. He lived at 796 Pine Street, San Francisco. His occupation was topographical draftsman for the U.S. government. His description was tall and slender with blue eyes and blonde hair. In the 1920 census, Eager, his wife and five-year-old daughter, Margaret, were in San Francisco at 244 21st Avenue. His occupation was “computer” draftsman. The Catalogue of Copyright Entries, Part 4, Works of Art, 1920, New Series, Volume 15, Number 1 included Eager’s work “Alas, the Dooserdoo”. The 1930 census said Eager’s home was 744 Paloma Avenue in Burlingame, California. He was an engineer with the federal government. Before 1935, Eager moved to Glendale, California. The 1940 census had his address as 410 1/2 North Jackson Street. The government engineer finished four years of high school and earned $2,800 in 1939. On April 26, 1942, Eager signed his World War II draft card. His address was unchanged. In 1949 Eager and Robert Lenon presented a paper to the American Society of Civil Engineers. The Official Register of the United States 1950 said Eager was at the Bureau of Land Management survey office in Glendale. The Gazette-Journal said Eager retired in 1950; his wife passed away in 1952; and their daughter was head of the psychology and sociology department at San Diego Junior college. Eager passed away April 12, 1965, in Los Angeles, California. He was laid to rest at Forest Lawn Memorial Park.